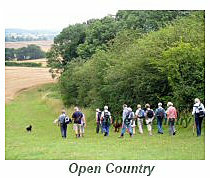 An enjoyable short 3½ walk with opportunity to enjoy the attractive countryside in both Worcestershire and Warwickshire. The walk incorporates a short section of the Millennium Way, where you will be guided by the distinctive Millennium Way way markers. Please note that the way markers in Worcestershire are green and those in Warwickshire black, but the logo is the same on both way markers. Find out more about the walk by clicking on the information icon. 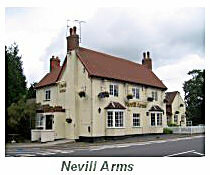 Our walk starts at the Nevill Arms at New End, on the A441 just south of Redditch. Emerging from the car park of the Nevill Arms turn right into Saltway and continue down to go left into Brandheath Lane. 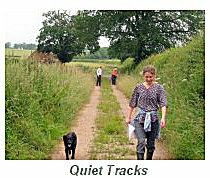 You are already on The Millennium Way and will be guided by the distinctive way markers. After 100 yards, just adjacent to the private driveway ahead, turn right down a hidden narrow passage. Go through metal gate into paddock and exit by a metal gate into a further paddock and continue ahead to take stile into field. Maintain line ahead to take next stile and pass under power cables at the corner of field. Here we leave The Millennium Way for a while and go left taking the footbridge with wooden rails and metal gates across ditch and into field. Stay ahead with trees and fence right to pass through large metal gate ahead with fence stile adjacent. Stay ahead to pass through corner gap and into scrub. Continue along narrow path with fence right and trees left. 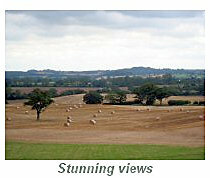 (From here you have a lovely view of the Malvern Hills on your far right). Emerge onto a grass and gravel track and take gate to reach road. Turn right down road to arrive at crossroads. Here turn left into Cladswell Lane and continue along the gently undulating lane for approx 1/2 a mile. You will continue on past Lower Cladswell Lane and Cladswell Close, the lane gently rising to a point where it turns sharp left into Church Lane. At this point do not turn into Church Lane but continue on the same line into the cul de sac following the public footpath sign. Stay ahead along the gravel driveway between the houses. Where the main driveway veers right just by a house called Lambrook continue straight ahead to take the public footpath signed "Oak Tree Lane" and through a wooden kissing gate ahead. Stay along footpath to exit by wooden kissing gate to driveway. Go left for 12 paces and take wooden kissing gate on right and continue along path beside large paddock with wood and wire fence on left. Emerge onto a driveway, pass a house called Crantock, and after 12 paces take narrow footpath left between fences and laurel to reach main road. Cross directly over main road and take way marked bridleway signed Alcester. Stay ahead with pine wood on left. Soon you will emerge into a field with glorious views ahead. Continue through gap ahead and gently down field keeping wood right. Stay ahead for some while, going downhill, not straying into the open field on left, but past a waypost down a narrow track. Once in a big field at the bottom of the hill proceed ahead to another waypost under a large oak tree. At this point stay forward for 15 paces ignoring corner gap and instead turn left in same field to continue along field edge with hedge right. The path weaves a little left and right, just stay along keeping hedge and trees right. Eventually you will come to a wide gap on your right marked with wooden posts and rail. Take gap and go right following around edge of field keeping hedge right. Shortly you will come to a wooden bridge which crosses a ditch and here you will see the first of the black Millennium Way way markers as you have crossed into Warwickshire (Do not cross this wooden bridge, but continue on with hedge right). You are now back on the Millennium Way and will remain so until the end of the walk. Continue along the edge of this vast field ignoring any gaps right and at the end of field continue through into next field with hedge right and after some 150 paces take large wide gap, continuing to maintain line, now with hedge left, and passing under power lines. Exit field by metal gate to left of brick outbuilding and cross driveway to take metal gate then go ahead up track. Go left through metal gate at top of track and bend right round base of field mound to pass to right of isolated brick building. Continue uphill, well away from fence left, along a very rough vehicle way which is usually grassed over and leads steeply up through trees to a field. Stay forward now with trees left to exit by wooden stile ahead into woodland. Exit woodland by stile ahead and go left along field edge to take further stile, some 30 paces in from left hand corner, into woodland. 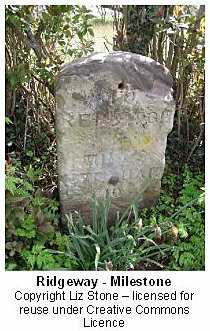 ( You will notice that the Millennium Way way markers have now changed back to green as we are back in Worcestershire). 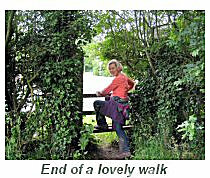 Exit woodland by stile and go with hedge right to take another stile to road. 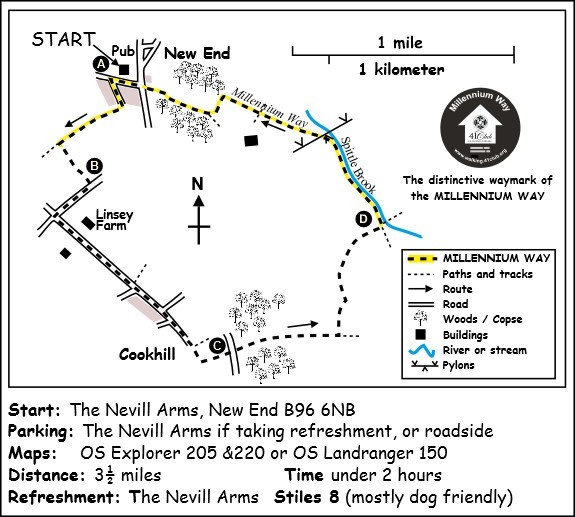 Cross the main road to arrive back at The Nevill Arms where we can take some welcome refreshment. A hamlet at the junction of the Salt Way and the Ridgeway. The Salt Way was part of the historic Ryknild Street, so called because it was one of the routes used to transport salt extracted from the Droitwich brine springs all the way to Saltfleet on the Lincolnshire coast. The salt was then loaded onto ships and exported to France and Scandinavia for trading purposes. The Romans also used the road that became the Upper Saltway as a frequent route between settlements and marching forts. The Ridgeway (now the A441 Evesham Road) was an ancient track between Redditch and Evesham, following the high ground above the valley of the river Arrow for security. The walk route takes you past the end of Church Lane. 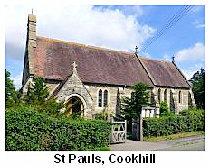 If you are walking at the weekend in the summer, a visit to St. Paul’s at the end of Church Lane is worth the diversion. It was built in 1876 by noted local architect Frederick Preedy. The church is open to visitors during the weekends in summer months and contains some fine Arts & Crafts stained glass by Sidney Meteyard (1868-1947) of Birmingham. 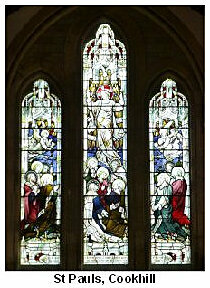 Sidney was an English art teacher, painter and stained glass designer. A member of the Birmingham Group, he worked in a late Pre-Raphaelite style heavily influenced by Edward Burne-Jones, William Morris and the Arts and Crafts Movement. He lived at The Malthouse, Evesham Road, Cookhill with his wife Kate Eadie (1878–1945) herself a jeweller. They met at Birmingham School of Art when she modelled for his pictures.